0.) Make sure you can access the device using a terminal like PUTTY. Type "V" to get the current version of the FW. 1.) Download the .hex file from Schmalz's UBW32 under the section labeled Documentation [ http://www.schmalzhaus.com/UBW32/ ]. The latest is v1.6.5 [ http://www.schmalzhaus.com/UBW32/FW/UBW32_v1_6_5.X/dist/MX795/production/br_1.6.5_D32.X.production.hex ]. 2.) Download the loader [ http://www.schmalzhaus.com/Tools/HIDBootloaderWindows_v2.9j.zip ] and extract it to any folder. 3.) Follow the steps here to upload the new FW. When instructed to start the loader, open HIDBootloader.exe from STEP 2 => [ http://hades.mech.northwestern.edu/index.php/Directions_to_Load_Files_to_PIC32 ]. Hey just a helpful comment for those of you that are porting MX460 code to the new MX795, check out the "APPENDIX A: MIGRATING FROM PIC32MX3XX/4XX TO PIC32MX5XX/6XX/7XX DEVICES" in the PIC32MX795 datasheet above. The way that certain interrupts are handled is different. Hopefully my couple hours of digging can save someone else some time. Brian Schmalz's website is down. Are there any other websites where I can download the UBW32 bootloader and find documentation/example code? Does anyone know if I can use this bootloader with other PIC32MX chips? In particular I'm using a PIC32MX250F128D on this wireless PIC32 development board http://modtronicsaustralia.com/shop/tinywireless-pic32-wireless-dev-board/ and would like to get away from need to use my pickit3 or ICD3 to program it each time. Less wires on the couch would make the family happy! If you are new to PIC32 you might find it intimidating. There is a lot of reading for sure. Just to avoid having to go back to the datasheets all the time when I change the device I created a library to streamline the process. It is available for free at http://rad32.gear.host with instructions, code examples and Fritzing schematics. Enjoy! I'm looking to make a DIY ARM based laptop, and I'm wanting to use a laptop keyboard and mouse (the little dot), as well as monitor battery levels. Would I be able to configure this to act as a HID mouse and keyboard, as well as something to report battery levels to the OS via USB? 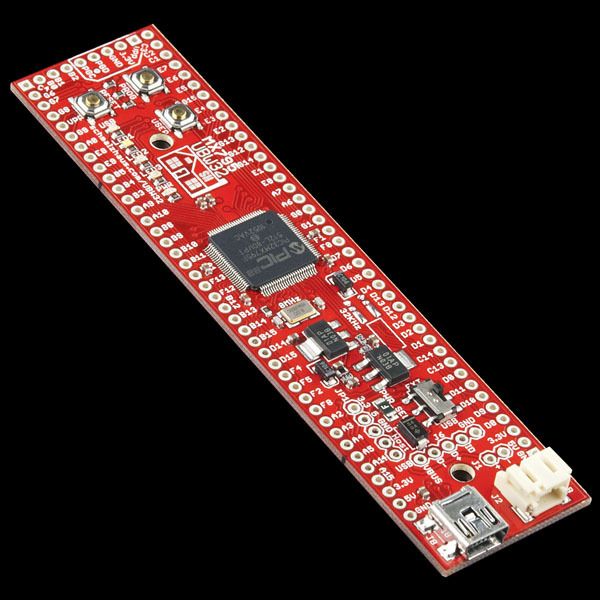 I bought the UBW32 from sparkfun and I was trying an example after I downloaded and installed MPLAB IDE ,C-32 Compiler and Microchip Solutions. Now I am trying to upload the code via the HID bootloader, but when for example I upload HelloUSBworld code, it uploads and when I reset the device it does not work. Can you please help me? are there any step by step instructions how to set the settings in the mplab ide. I used http://www.schmalzhaus.com/UBW32/doc/How-To%20Compile%20Projects%20for%20the%20UBW32.pdf but still cannot work properly. Please let me know at my e-mail address brian@schmalzhaus.com if you are still having trouble and I can walk you through the process. I wish to ask you guys some questions about the 32-bit whacker, does it need a programmer such as pic kit ? or it can work with the USB and download the code to the PIC? The UBW32 does NOT need a separate programmer hardware. There is a free application (HIDBootloader.exe) that you can download from the UBW32 website that will allow you to send a new HEX file over to the UBW32 via USB. This is a great product! I have both the MX460 and MX795 versions. I needed a logic analyzer and made one with the MX795 board and OpenBench LogicSniffer, CoreTimer is a great MIPS core feature! Do I need the windows driver to get this working? I can't install it in my computer. UBW32 with PIC32MX460 and PIC32MX795 are supported by Pinguino project, that give you the power of a full open source gcc, with optimized code and easy way of Arduino language. Could someone please give me a short example of how i can set a pin HIGH/LOW including the definitions. I'm trying to understand the LATE, LATEbits.LATE3, TRISE but i dont understand it. If you have a link to an informative beginner website I'd be happy too. 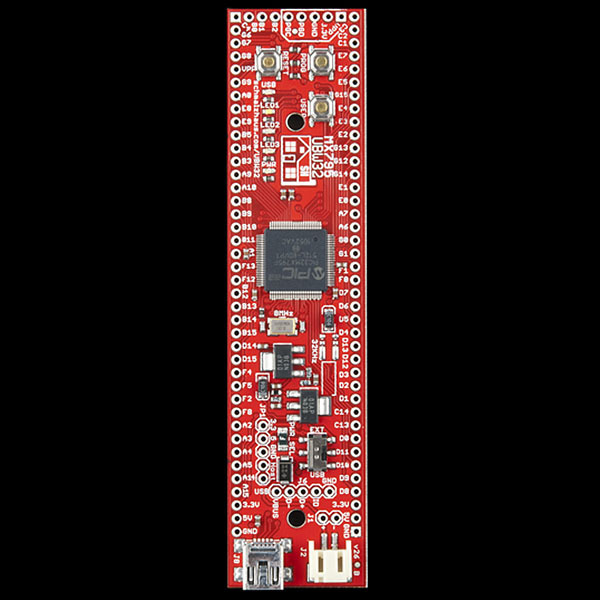 Am I being daft or can you not mount the Sparkfun recommended USB connector to the bottom and still plug the board into a solderless breadboard? It seems that the height of the USB type A plug is exactly the same as the commonly available .100" header pins. There isn't enough room to hang the USB plug off the end of the breadboard either. I'm going to fire up the belt sander and see if I can remove some metal. Nope, you're not daft. Once you solder on any connector to the underside, you will not be able to mount to a breadboard unless you use longer pins. This is just the nature of putting connectors on the bottom of the board - it can't really be helped. I would like to buy only the UBW32 PCB (without any components) can you make me an offer ? 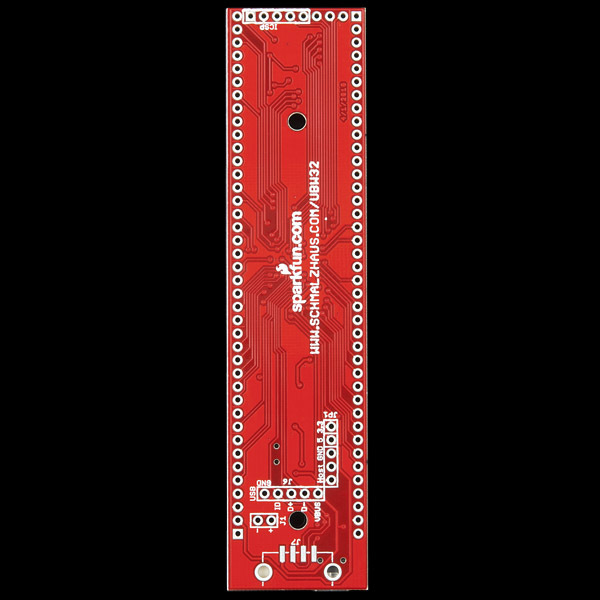 If you want, the design files are available on my UBW32 website, - you could have the board made at BatchPCB or any of the other PCB vendors out there. I havent had this much fun since I found a box of blasting caps near an old bridge. This uP is fast, lots of room for all kinds of data and code. the StickOS makes this a so simple thing to program. the IC/sp com code makes io a breeze. thanks to all theose who have contributed. Because it has a Phase Locked Loop (PLL) internally and the core freq can be set by software parameters to be via the PLL up to 80MHz - Pretty cool. I'm the proud owner of one of these dev boards and i've used it with great joy. Up untill now, I've powered the device through the USB connection but since I'm now using it to control my lego robot, I want to use the little white powersocket that is attached tot the board. Problem is, and this might be a really stupid question, I don't know what kind of connector it is and where I can get the plugcounterpart. Are they available on sparkfun? I need to be able to drive 2 brushed DC motors with incremental encoder feedback. The motors draw about 1 amp each. I want to use the PIC32MX795 Development Board to do that but I cannot do any hardware development and was wondering if someone can suggest: is there an H-bridge that plugs directly into this dev board's PWM outputs and if there is a an opto-isolated encoder daughter board that can also be used by the PIC32MX795 Development Board. This is a simple system but I cannot spend the money on industrial components that cost $100's. Can the PICKit3 do source level debugging for this version of the UBW32? Yes, but everyone should be aware that the PICKit2 does NOT support the new MX795 CPUs. So you'll need a PK3 or better to program/debug this new guy. Yes, I am using a PICKit3 with MPLAB v8.66 and programming/source debugging the new MX795 model. Send me your e-mail address and I can send it to you. Because the two chips are so similar, I did not update the schematic symbol to the new part, so you'll find there are no pinout differences. I just posted a quick port of StickOS to the UBW32 with PIC32MX7. Yes. The MX795 is source level compatible with the MX460. So you should re-compile your code. It is also pin compatible, I believe. It is not binary compatible, although it is close. The location of the UART registers are the only thing I know of right now that will prevent a binary built for the MX460 from failing on the MX795. Don't forget that it does CAN and Ethernet too ! You know, I hear this at least once a week. For some reason, there are a large number of people who believe that you have to pay for Microchip's C compilers. This is NOT TRUE! I use the free versions every day, and they work great. They have free versions of C18 (for their 8-bit PICs), C16 (for their 16-bit PICs) and C32 (for the 32 bit PICs like on the UBW32). The latter 2 are GCC based. Are they as awesome as the relatively expensive Hi-Tech compilers? Nope. But Hi-Tech has free versions of it's amazing compilers too. Lack of a C compiler is not a good reason to stay away from Microchip parts. Do I wish C18 were a better compiler? Hell-yah, twice over. But all of Microchip's sample code works with their free versions, and works well. The only thing 'cripple-ware' about Microchip's free compilers is some extra optimizations are left out. Other than in one very rare circumstance related to a USB bootloader with C18 has this ever been a problem for me. Would you recommend the C32 compiler or the free Hi-tech one? I use C32 exclusively (the free version). I've heard lots of great things about Hi-Tech though. But now that Microchip owns both, they've merged them and created XC32, which is a very good compiler (complete C++ support). The UBW32 code is all written with C32, but should be usable in XC32 with very few changes. The free version of XC32 is not limited in any way except you can't use -O2 or -O3 (they give you -O1 for free). "All of the 78(!) of the PIC32's I/O pins are broken out. " "All 78(!) of the PIC32's I/O pins are broken out. " Same here... I wish I knew... Nevertheless, great news! What a coincidence. My (now deprecated) DEV-08971 just arrived today. Just wondering, is this a 4 layer pcb? Nope, just a 2-layer board that took me for-freeking-ever to route because of the much larger 8MHz crystal and the new 32KHz crystal footprints. Sorry about those couple pins on the edge - what I do is put male headers pointing down on each of the 2 long sides, then male headers pointing up on the remaining short edge. That way I can plug in my PICKit3 really easily for debugging/programming. Well it was time well spent. I am making a code archive database / IDE for the StickOS. I know people want C but this StickBasic is just fine for all but the tightest applications. really though it can do it all. i assume batchpcb produces these PCBs? i was going to make my own after buying this but realized my vias would be too large to get the size you achived. ill get one or two this month. Well, SparkFun makes the boards and they have their boards made at Gold Phoenix. So does BatchPCB. That doesn't mean that they use the exact same 'rules' for all SparkFun boards and BatchPCB board though. Sparkfun doesn't use Gold Phoenix. Only Batchpcb does. Great board, when used with MMBasic it does all I required. If you ever want to upgrade it a micro sd card slot would complete the perfect board. You could remove the power connector and place it next to the USB connector. For most people a surface mount SD card socket is difficult to fit and any worthwhile project needs an SD card. The UBW32 remains at the center of my MIDI Encoder/Decoder for Allen Organs (and others). I program in C using the extensive Microchip libraries along with the free IDE and compiler. My application scans up to three organ keyboards and the pedal board. It handles up to 64 pistons and 96 SAMS (magnetically switched stops), encodes up to eight analog potentiometer inputs, switches a sparcfun power relay, controls a four output Allen organ power supply, drives a 2x16 LCD display, and provides six status outputs for LEDs. The UBW32 has been reliable and a pleasure to work with. Additional information can be found at www.kinkennon.com. My site is presently under construction but will include a project schematic and programming files soon. There is a PCB shared at OSH Park. The least expensive PIC32 board, last I checked. Good for those of us who like to have everything on breadboards. PIC32MX795 is popular in a lot of other dev boards, so googling things is easy. In addition to the UBW32 bootloader, I suspect that bootloaders from other PIC32MX795 boards would probably work too. And ChipKit apparently works with this too. I have used the 32-bit whacker for a number of projects. My first was a antenna used for satellite communication, the second and third was a CNC router. The Bit Wacker was used, mostly, to control the stepper motors. All the pins of the PIC32 are brought out to the peripheral of the board making it easy to connect these to an external circuit. There are on board leds that can be programmed along with the small switches which I found useful for status. 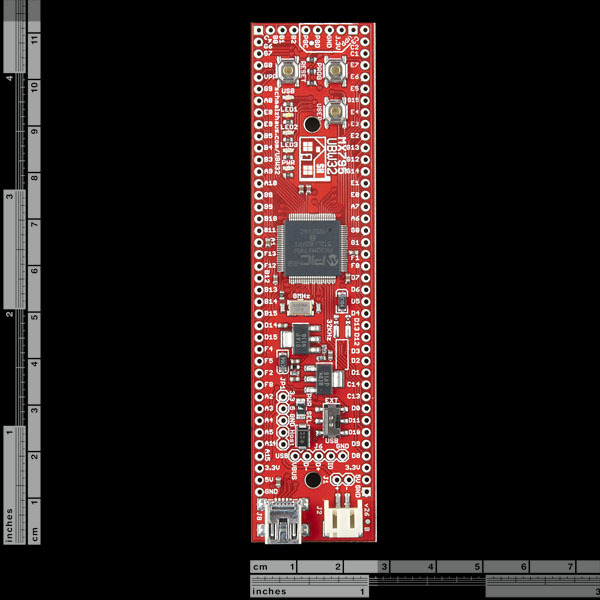 Schematic of the board is available and easy to read, and there is starter software to use the USB, although very dated, but a good starting point. Bottom line is if you are planning to program a PIC32 and need an easy way to get started, this is a good board to use.